A 7.1MW biomass power plant to be built on the Haiwaiian island of Kaua‘i has received approval from the local Planning Commission. The plant, owned and operated by Green Energy Hawaii, will use albizia trees, a hardy species that grows in poor soil on rainfall alone. The renewable power plant will meet 10 percent of the island's energy needs. Kauai World - February 27, 2007. Tasmania's first specialty biodiesel plant has been approved, to start operating as early as July. The Macquarie Oil Company will spend half a million dollars on a specially designed facility in Cressy, in Tasmania's Northern Midlands. The plant will produce more than five million litres of fuel each year for the transport and marine industries. A unique blend of feed stock, including poppy seed, is expected to make it more viable than most operations. ABC Rural - February 25, 2007. Global biodiesel production is increasing rapidly. The consequence is that a byproduct obtained from making the biofuel, glycerin (glycerol), is beginning to flood the market. As vegetable oils are transesterified into biodiesel, some 10% of the resulting product consists of glycerin. In short, it is an important co-product. Finding new applications for it is crucial to make biodiesel production more competitive with fossil fuels. Researchers are making progress: so far they found that glycerin can either be used as a biofuel in itself, as a feedstock for the production of biogas, or for green specialty chemicals (such as propylene glycol). Other scientists tested glycerin as a poultry feed and found positive results. A recent EU-study showed that if used as a feed component, the massive influx of the byproduct may even result in lower meat prices for consumers. Along the same lines, researchers from the University of Missouri-Columbia are now studying whether glycerin can be used to feed cattle. In a study that began this month, Monty Kerley, professor of ruminant nutrition in the College of Agriculture, Food and Natural Resources, is examining the effectiveness of glycerin as component in cattle diets. Through November, the MU researcher will monitor the growth habits of 60 calves from various breeds to determine if the leftovers provide a healthy main course to cattle. The study has two main priorities: first, to determine if glycerin has a positive or negative effect on calves' growth performance, and second, to assess its impact, if any, on meat quality. "We're really looking at the energy value and how it compares to corn," Kerley said. "When the animal consumes glycerin, it's absorbed, and the glycerin is used to make glucose. Actually, it's like feeding sugar to a cow. Because it's liquid, there are two things we worry about - one, how much can be used in the diet before it changes the form of the diet; and two, is there a limit to how much glycerin can be processed by the animal? We'll feed it to them for a period of 160 to 180 days." Kerley said developing usages for glycerin necessitates this type of research. In recent years, academic scientists and private-sector companies have been racing to find solutions and applications for the byproduct. An alternative food source for cattle is but one possibility. However, it's likely only a short-term option for the cattle industry. "We probably have a three- to five-year window to use this for animal feed at a reduced cost," Kerley said. "This glycerin is a wonderful starting compound for building other compounds that can be applied to numerous industrial purposes. After three to five years, you'll see industrial applications utilizing this glycerin, and that may price it out of the animal feed industry." He said economics are another factor because glycerin is currently less expensive than corn, which is most commonly used as cattle feed. Glycerin is about 4 cents per pound; corn costs around 8 cents a pound. "Originally, the biodiesel plants were concerned with just getting rid of this material, but data shows that glycerin has energy feed value equal to corn," Kerley said. "If you can get glycerin for less than corn, that's obviously a sizeable savings." Image: biodiesel production is achieved by transesterifying vegetable oils. Glycerin settling at the bottom of a batch of biodiesel. Biodiesel production results in a fraction of 10% glycerol, making it an important byproduct. Thanks to his fame, professor Expedito Parente, the father of biodiesel and bio-jet fuel, is now on the brink of launching a vast agro-industrial project in Brazil's Nordeste region based on cooperatives that will be serving as a model for reducing extreme rural poverty in tropical countries. And surprisingly, the professor is looking at a relatively unknown palm tree for the production of vast quantities of biofuel, namely the Babassu palm (earlier post and here). At 66 of age, doutor Expedito has never been so requested. His 'bioquerosene' (biokerosene) should be a way to reduce carbon dioxide emissions in aviation and to prepare for a gradual substitution of jet fuel. Parente's fuel was courted by both NASA and Boeing. Tests have been performed since mid-2006 and are believed to soon enter a decisive stage at Boeing’s facilities in Seattle. Contrary to bioethanol and biodiesel already established in road transportation worldwide, biojet fuel is a vegetable product which has still not been in commercial use. For a long time, Expedito Parente (left in the pic) was a professor at Ceara Federal University in Fortaleza, a large city in Brazil’s Nordeste region. When he retired, this hyperactive academic wanted to continue to do something useful. In 2001, he thus founded Tecbio, a small engineering firm developing biodiesel refineries. It was nicely timed. Tecbio has now a staff of eighty and is growing exponentially. But Dr. Parente nourishes a double obsession: to be the first to make airlines adopt bio-jet fuel, an important technological step ahead of ordinary biodiesel, and producing this biofuel in Brazil in a socially correct way. In 2005, professor Parente won the Blue Sky Award for his aircraft fuel project, "a kind of Nobel prize given by the UN for innovations in the field of renewable energies", he comments. Interest for the invention was confirmed at the beginning of this year at a Washington D.C. seminar organized by the Transportation Research Board, a government agency. Participants were confronted with an apparently absurd question: "May Babassu already be a renewable source to serve as substitute for jet fuel?" This palm tree, unknown to most people in the West, grows in the wild on 18 million hectares (45 million acres) in Brazil's forest in the North East. Such size corresponds to six times Maryland or roughly half the size of Switzerland. It was Expedito Parente who discovered that the nuts of the babassu - or more precisely the kernels within - can be turned into an oil that possesses energetic properties which make it an ideal feedstock for bio-jet fuel. At the time, petroleum prices went down dramatically. And we must understand that a fuel to be acceptable for modern jetliners has to be extremely reliable and resistant at very low temperatures, it is a complex product. There is a new dimension to what is at stake. To fly from London to Rio, and back, provokes individually as much CO2 emissions as those generated during fifteen months of sedentary life in a European capital, heating and local transportation included, if we are to believe comparative studies of environmental impacts. Already, air transportation operators supply travelers with different service contributions to buy, in compensation for greenhouse effect emissions. Globally, airlines gulp down 26 billion gallons of fuel per year, and this figure may double in twenty years. 20 per cent of their operational costs correspond to fuel. For the first time in 2006, the fuel bill exceeded costs for staff in the sector. Sir Richard Branson, British business mogul, scorching supporter of many environmental causes, but mainly founder and president of the Virgin group which counts several air transportation carriers, said in a recent interview that "immediate solutions" should be found (earlier post). Could the babassu palm make the difference? 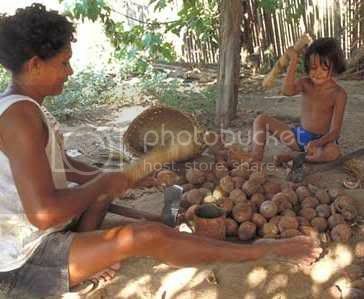 A Brazilian law grants the local population the right to collect babassu nuts freely, independently of who owns the land. A situation of ecological balance totally opposed to the one to be observed in Malaysia or Indonesia, known to shelter the largest palm tree plantations in the world, but also encouraging deforestation and boosting the greenhouse effect as the original jungle is frequently permited to be burnt down. Today, biojet fuel does not seem to be entirely competitive though, as jet fuel derived from petroleum is sold free from taxes at 1,5 USD per gallon, which is still very cheap. Soon there will be eco-taxes on aviation fuel. And I am pretty sure that authorities will make it mandatory to blend conventional fuel with biojet when available. Costs will also shrink significantly when industrial production is started. If 20 per cent of aviation fuel were to be produced in form of green fuel for blending, such volumes would correspond to some 30 million acres land. It’s a huge territory, I agree, but it is less than the existing Babassu forests. Tecbio and its involuntarily hype boss have furthermore a very clear social vision. This is important to emphasize, as bioethanol mills using sugar cane as raw material has not reduced poverty in the Brazilian countryside. Seasonal plantation workers called boias frias (“cold billies”) have a hard time. Because of piece-work, a Brazilian cane cutter will only ‘last’ twelve years, less than a slave in ancient times, according to a recent study. Such conditions are intolerable. We have our own model which pretends to reconcile social development and industrial dynamics. At present date, Tecbio is leading two pilot projects in collaboration with federal authorities. The idea is to create cooperative units, in association with the local population, for a socially correct production of biodiesel derived from Babassu kernel oil. Respecting the environment, this model should be replicated in other regions, for examples in deforested areas of the Amazon and in Africa. One has to be pragmatic. We work with feasibility from an economic point of view. Running a cooperative does not mean that it should not be profitable. In a basic scheme, each cooperative shall produce three million liters [800,000 gallons] of biodiesel/biojet fuel per year, together with several other products originated from the nuts. There will be some agriculture. All the electricity consumed in the cooperative shall be generated organically on the spot. Each cooperative is giving part-time jobs to 3,000 peasants. On the other hand we study also ecologically run Babassu plantations. Developing and designing innovative biorefinery concepts to make biomass-derived products cost-competitive with fossil fuels is the goal of the EU's newly launched BIOSYNERGY project. One of the main energy policy targets of the EU is to accelerate the use of biofuels - any fuel that is derived from biomass (plant or animal waste) in order to transit towards a low-carbon economy. Candidates for producing domestic biofuels include feedstocks such as sugar, wheat and corn. Unlike other natural resources such as petroleum, coal and nuclear fuels, biofuels are renewable energy sources. However, using biomass grown in the EU to produce transportation fuels, and to a lesser extent energy, is still more expensive than using these traditional resources. For this reason, the four year, €13 million BIOSYNERGY project will work towards establishing a large scale biorefinery that can produce a number of high value chemicals, as well as large volumes of liquid transport fuels, and use the leftover energy to heat and power the plant. The project is funded under the EU's 7th Framework Programme - Energy. The project aims to integrate synthesis processes (to obtain transportation fuels and green platform chemicals), and energy production (power, CHP) by application of innovative synergetic biorefinery concepts, using advanced fractionation and conversion processes, and combining biochemical and thermochemical pathways. In this way the project partners hope that the chemicals will boost profitability, whilst the transport fuels will replace some of the fossil fuels currently on the market. The reuse of excess heat and power will also cut carbon emissions. "BIOSYNERGY aims to achieve sound techno-economic process development of integrated production of chemicals, transportation fuels and energy, from lab-scale to pilot plant. This project will be instrumental in the future establishment of biorefineries that can produce bulk quantities of chemicals, fuels and energy from a wide range of biomass feedstocks." - Hans Reith, from the Energy research Centre of the Netherlands (ECN), coordinator of the BIOSYNERGY project . "We're developing concepts and carrying out supporting research to provide data to help implement a future biorefinery," said Tony Bridgwater, Head of Aston University's Bioenergy Research Group, a partner in the project. BIOSYNERGY will set up pilot plants of the most promising technologies for a 'bioethanol side-streams' biorefinery, in close collaboration with a lignocellulose-to-bioethanol pilot plant currently under construction in Salamanca, Spain. Aston University will also lead work to identify the optimum biorefinery based biomass-to-product chains for a future European bio-based economy, test and characterise biomass and lignin in its fast pyrolysis reactors, and produce a BIOSYNERGY Road Show to communicate results. Agro Industrie Recherches et Developments, Institut Francais du Petrole, Centre for Renewable Energy Sources, Biomass Technology Group, Joanneum Research Forschungsgesellschaft, Biorefinery.de, Glowny Instytut Gornictwa, IE - Joint Research Centre, Chimar Hellas S.A., and Delft University of Technology. Cordis News: EU project aims to make biomass derived products competitive with fossil fuels - May 25, 2007. A refreshing piece on how ethanol can reduce global poverty appeared recently in the New West Network. Granting countries from the South tariff-free access to the US and EU biofuel markets would reduce illegal immigration, benefit the environment, help the poor (in the South and in the North), make both fuel and food less costly, and reduce the West's dependence on imported oil, he says. This a line of argumentation that comes closes to that of the Biopact. Expanding worldwide demand for ethanol has caused Brazil to rapidly increase ethanol production. Land previously used for coffee and other crops has been transferred to sugar cane to meet ethanol demand. As any socially conscious coffee drinker knows, coffee growers are often confined to poverty because of low coffee prices. The Economist has frequently pointed out that coffee prices are low because of a worldwide glut of coffee beans. Reduction in coffee bean supply in Brazil, which is the world’s largest coffee producer, would improve worldwide coffee prices, and with it, the lot of coffee growers. The exercise could be repeated for a whole range of other cash crops, on which so many in the South are dependent. To put this in perspective, about 5% of the world’s petroleum comes from Iran. Oil and gasoline prices are profoundly sensitive to changes in supply and demand. This is why cartels from Standard Oil to OPEC and the Texas Railroad Commission have worked hard to limit worldwide oil production. A surge in worldwide fuel supply would likely reduce gas prices in the United States. High energy prices disproportionally hurt the poor, and lower in gasoline prices would be most helpful to the poor. This is true in the United States and other countries. The vast majority of the world’s poor countries are net oil importers. Money spent on oil is unavailable for food and other necessities. Countries from Peru to Mexico could eventually be major ethanol producers. The most painless and least controversial way to reduce illegal immigration is the creation of jobs in Latin America. In Brazil alone, it is estimated that 1 million people work in the ethanol industry. For Europe, the same logic holds. If a biofuel industry were created in Africa, the massive and dramatic influx of illegal immigrants, who risk and often lose their lives in their attempts to reach the EU, could be reduced (Senegal's president, Abdoulaye Wade, has been promoting biofuels with this perspective in mind, see here). The poor in the U.S. and Latin America would benefit from lower corn prices, jobs, cheaper fuel and higher cash crop prices. Energy security would improve if fuel came from friendly countries like Colombia and Brazil instead of the Middle East, Russia and Venezuela. Lower oil prices would weaken defiant anti-American leaders in Iran, Venezuela and elsewhere. The best explanation for the persistence of the ethanol tariff is that Iowa is a very important state in Presidential politics. Iowa receives more farm subsidies per capita than any other state. Conveniently, the Iowa State Caucus is the first binding contest in the race for the Presidential nomination. Iowa is also one of the tightest swing states in the general presidential election. In 2000, Al Gore carried Iowa. With the help of generous expansions in farm subsidies, George Bush carried Iowa in 2004. In each of these contests, the margin of victory was well under 1%. Anyone aspiring to become or be re-elected as President would be unwise to upset Iowans. Tariff-free access to the U.S. market would be a carrot for reform throughout Latin America. Basic poverty-fighting measures like women’s rights, property rights for the poor and transparent, democratic government could all be prerequisites to dropping the current ethanol tariff. In Europe, the hope of access to the common market of the European Union helped democratic, transparent governments spread throughout former Communist states. Ethanol markets could have a similar impact on Latin America. Brazil is a good US neighbor, the author says. Brazil’s center-left President, Lula da Silva has committed to paying Brazil’s international debt, helping the poor and being a responsible member of the international community. Brazil has contributed thousands of soldiers to the U.N. stabilization mission in Haiti. Other Latin American countries, including Colombia, Honduras, and El Salvador have been staunch U.S. allies in recent years. Granting these countries tariff-free access to the U.S. ethanol market would reduce illegal immigration, benefit the environment, help the poor and reduce our dependence on imported oil. President Bush will never face another Presidential election or Iowa Caucus. For all of these reasons, the author thinks, it is time to begin phasing out ethanol tariffs. Image: a Rwandan coffee farmers, struggling against low prices for his product. A global switch to biofuels would allow farmers to diversify their crops and to access the new market, which would prop up prices for their cash-crops. Cuba is quietly modernizing its ethanol-producing facilities, despite Fidel Castro's repeated assertions that making more of the biofuel is a bad idea. Hypocrisy or not, the fact is simple: Cuba has the capacity to become a major ethanol producer, and it will not hesitate to take advantage of the opportunity. Earlier we reported on how the emerging biofuels market may revive the island's once thriving sugar industry (previous post), and the first concrete voices pointing in that direction can now indeed be heard in Havana. During the Soviet Era, the Cubans systematically bartered and sold large quantities of sugar in exchange for Russian oil and fuels. This sugar-for-fuel relationship was the result of Castro's first formal deal with the Soviets, made in 1960. At the height of these exchanges, he enthusiastically launched an (infamous) plan which forced all Cubans to produce a 'Ten Million Tonne Harvest'. Even though that target wasn't reached, the campaign succeeded in turning the island state into a major exporter. Later on, Cuba did achieve an annual production of 10 million tonnes. After the collapse of the Soviet Union, Cuba suddenly lost its market and the sugar sector entirely disintegrated, with half of all mills halting their operations. In 2006, Cuba produced a meagre 1.5 million tons... With the demise of the USSR, the island also lost its access to a steady supply of cheap fuel. Despite Castro's criticisms, Cubans now make the obvious connection: if sugar is fuel, and we don't have fuel but we do have the potential to produce massive quantities of sugar, then why don't we turn our sugar into fuel? Indeed, the new ethanol market will revive the sugar cane industry, boost Cuba's energy security and opens unprecedented export opportunities that bring in the scarcest of all goods - hard foreign currency. A first sign of the island's attempts to kickstart a biofuel industry was given earlier this year when it signed an agreement with Venezuela to jointly build 11 new ethanol plants (previous post). And now Dr. Conrado Moreno, executive director of the Universidad Técnica de Energía Renovable de Cuba (UTER) and member of Cuba's Academy of Sciences, says the island plans to upgrade 11 of its 17 existing refineries with the aim to produce the green transport fuel. These plants currently produce up to 180 million liters (47 million gallons) of ethanol, but the alcohol is used in rum and other spirits, as well as for medical purposes and as a cooking fuel. Moreno said that the upgrading of the ethanol plants will give Cuba the capacity to produce fuel for cars "in four or five years". 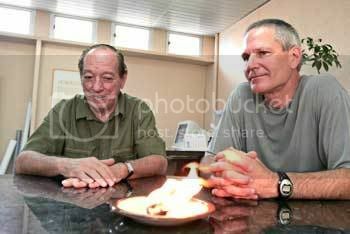 The scientist spoke at a conference on renewable energy organised by UTER in Havana. Over the past months, Castro has vehemently criticized a U.S.-backed plan to produce ethanol from corn for cars in a series of editorials published in state-run newspapers, claiming it will cause prices of farm products of all kinds to spike and make food too expensive for poor families around the globe. He later said he didn't have any objections to Brazilian biofuels, which are made from sugar cane. Brazil is the world's leading producer of ethanol from sugar cane. In March, the country signed an agreement with the United States to promote biofuel production in Latin America and to create international quality standards to allow it to be traded as a commodity like oil. That agreement helped spark the editorials from Castro, which have been read repeatedly on state television and radio. In them, Castro distinguishes between the cane ethanol Cuba produces and the corn-based biofuel common in the U.S. The 80-year-old revolutionary released another signed opinion to foreign journalists Tuesday night, saying the damaging effects of producing ethanol from corn were not new. "The dangers to the environment and the human species are topics on which I have been mediating for years," Castro wrote. "What I never imagined was the immense risk." Japan largely relies on food from abroad as cheaper imports have driven many farmers out of business and into the cities. Given the fact that in modern societies, mobility is as important as cheap food, high oil prices are forcing some to dare to venture into turning a staple like rice into liquid fuel. Apparently there is no alternative (except for driving less, but for most people that is not an option - the low price elasticity of the demand for oil shows this). Japan has been looking into importing biofuels from Brazil and South East Asia (previous post), but an alcoholic beverage maker, Oenon Holdings, may change this trend. The Tokyo-based company announced it wants to produce bio-ETBE derived from ethanol made from rice to mix with gasoline, a challenging plan in a country where costly farm produce has kept the usage of green fuels largely at bay. A five-year project to build and run a 15 million liter (3.96 million gallon) ethanol plant in Tomakomai city, located in the southern coast of the northern island of Hokkaido, is awaiting government approval. The Ministry of Agriculture has set aside 8.5 billion yen (€52/US$70 million) from its annual budget to promote locally-made green fuels to supplement gasoline for auto use given hefty carbon emissions reduction targets to meet under the Kyoto protocol. 55 ethanol gas stations were opened last month on a trial basis in selected locations in Japan (earlier post). The plan is part of Japan's recently announced committment to slash 50% of its greenhouse gas emissions in the post-Kyoto era (that is from 2012 onwards). "The fate of the project is yet to be known until the farm ministry makes a decision," said Hisako Kawakita, a spokeswoman at Oenon, which has its roots in 82-year old distiller of traditional spirit from potatoes in Asahikawa city, central Hokkaido. Japan, the world's second largest gasoline consumer of some 60 billion liters (15.85 billion gallons) a year, is almost totally dependent on imported fuels, and in 2006 produced only 30,000 liters (8000 gallons) of ethanol at government-backed pilot plants. Counting on 2.25 billion yen (€13.7/US$18.5 million) on subsidies, or a half of the planned spending, the project plans to build an ethanol plant with annual capacity of 15 million liters according to private research Hokkaido Intellect Tank, a member of the project together with the Hokkaido municipal government and other entities. Oenon, named after Oeno, the goddess of wine in Greek mythology, is expected to contribute its existing distillation technology to the project. The plant's commercial production is expected to start in the year starting in April, 2009, and the product would be used to make green ethyl tertiary butyl ether (ETBE). It was only late last month when gasoline blended with ETBE - a popular petrol additive for green-conscious drivers in Europe - started trial sale at 50 pump stations in Tokyo and surrounding areas. Hokkaido Intellect Tank said in a statement that the project plans to use imported rice as feedstock initially to lower costs, which is later to be replaced with Hokkaido-grown rice. Large-sized farming is common in Hokkaido, where rice production per acreage for the 2005 crop was about 8 percent higher than the national average. Oenon formed a holding company in 2003, with several regional alcoholic beverage firms under its umbrella. The most detailed portraits ever of the Earth's land surface have been created with the European Space Agency's Envisat environmental satellite. The portraits are the first products produced as part of the ESA-initiated GlobCover project and are available online to all. The images are ten times sharper than any previous satellite maps. A small composite Earth map taken at 300 metre resolution between May and June 2005 can be viewed here [*.jpg/1MB]. 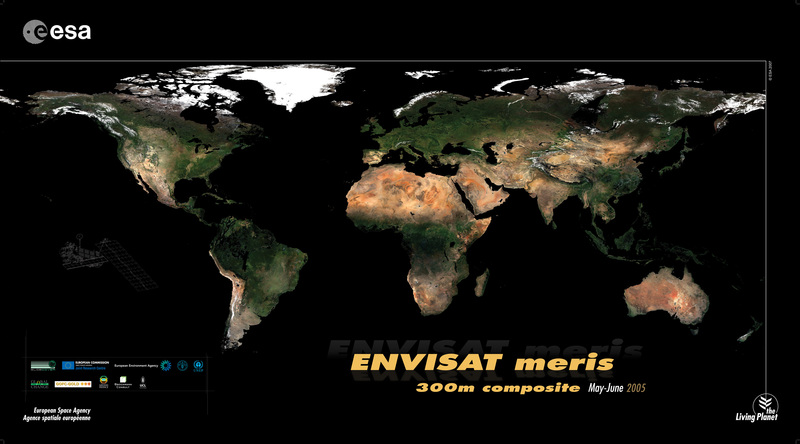 Bimonthly global composites for May to June 2005 and March to April 2006 can be accessed through a newly developed map server tool on ESA’s GlobCover website. On 19 June, additional bimonthly global composites will be made available as well as the first part of a global land cover map over Eurasia. Around 40 terabytes of imagery – an amount of data equivalent to the content of 40 million books – were acquired between December 2004 and June 2006 and processed to generate the global composites. We have previously drawn attention to the importance of earth observation (EO) tools and satellite maps in managing the nascent global biomass and bioenergy sector which is set to alter land-use change patterns around the world (here). ESA's new composites will support the international community further in modelling climate change extent and impacts (see EO's role in studying the carbon cycle), analysing ecosystems and plotting worldwide land-use trends. The Food and Agriculture Organization of the United Nations (FAO), which is heavily involved in studying the potential effects of bioenergy production, will use GlobCover products to support many of its activities. "GlobCover products should constitute an important interpretation asset in support of more dynamic environmental parametres such as rainfall and vegetation condition for FAO's global and national food security early warning programmes on which ESA and FAO cooperate closely," FAO’s Dr. John Latham explained. Ron Witt from the United Nations Environment Programme’s (UNEP), also looking at biofuels and bioenergy, said: "The GlobCover data sets should allow UNEP to do frequent monitoring of environmentally-critical sites and known 'hot spots' in areas we have under examination around the globe, and to update our knowledge of such changing environmental conditions, in order to alert the global community to emerging problems before it is too late for decision-makers and civil society to take action in this regard." GlobCover is taking place as part of ESA’s Earth Observation Data User Element (DUE). An international network of partners is working with ESA on the project, including the United Nations Environment Programme (UNEP), the Food and Agriculture Organisation (FAO), the European Commission's Joint Research Centre (JRC), the European Environmental Agency (EEA), the International Geosphere-Biosphere Programme (IGBP) and the Global Observations of Forest Cover and Global Observations of Land Dynamics (GOFC-GOLD) Implementation Team Project Office. "GlobCover is an excellent example of a successful inter-agency partnership, and we are especially pleased that the LCCS – a joint FAO/UNEP standard – is being used as the basis of the classification," Latham said. The GlobCover processing chain has been developed by MEDIAS France, which is also operating the processing chain, together with Brockmann Consult, the Université catholique de Louvain and partners. Users are encouraged to provide feedback on data access and product quality by email to [email protected] by 1 June. Those interested in attending the user consultation meeting may apply by emailing the same address. ESA: ESA presents the sharpest ever satellite map of Earth - May 11, 2007.